Hello, everyone! Today we are thrilled to host our stop on the official When We Wake blog tour! 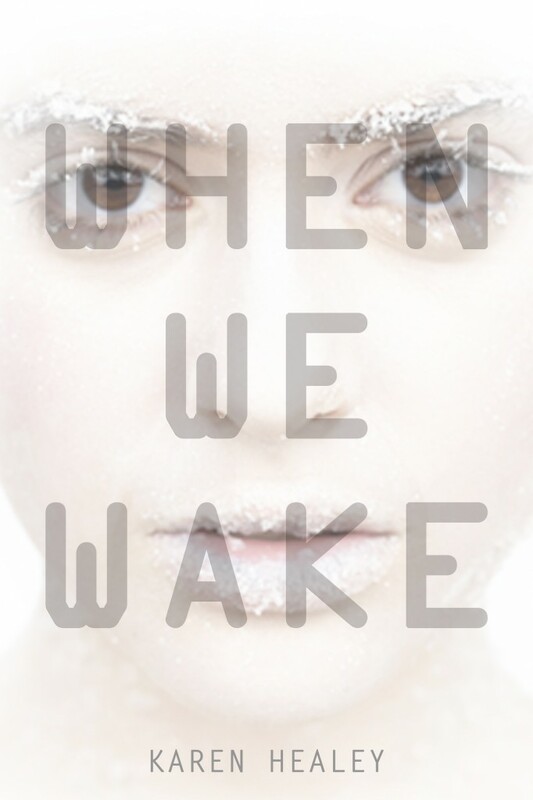 The third novel from the thoughtful, wonderful Karen Healey, When We Wake is a future dystopian SFF novel about an Australian teen who – thanks to the miracles of cryogenics and modern science – is revived a hundred years in the future following her untimely death. To celebrate the release of the book, we are thrilled to have a very special interview – but not with Karen Healey. Instead, we are very excited to have a quick chat with Abdi, one of the main characters in When We Wake! Abdi is an immensely talented musician from Djibouti, who is in Australia thanks to a “Talented Alien” visa, and who crosses Teagan’s (When We Wake‘s heroine) path in school. Here to answer a few sensitive questions about immigration, please give a warm welcome to Abdi! The Book Smugglers: Hello, Abdi, thanks for taking the time to speak with us today – especially about such a sensitive and loaded topic, immigration. Abdi: You’re welcome. I understand this interview won’t be ‘cast until after I leave Australia? The Book Smugglers: That’s right. Abdi: All right. That’s good. The Book Smugglers: Let’s get started. The Australia of the future is a place of plenty, but also has incredibly stringent policies when it comes to immigrants – in particular, its No Migrant policy means that no foreigners can enter and be naturalized as citizens. As a temporary resident, travelling on a short term visa, what does this No Migrant policy mean to you? How does it affect your family and your future? Abdi: It means that there are severe restrictions on my time here. I have 48 hours after graduation – or after I have been deemed ineligible to graduate – to leave Australia. It doesn’t really mean a lot to my family. They don’t want to live in Australia. I don’t want to live in Australia. I want to go back to Djibouti. But many people do want to live in Australia, to permanently move here as residents, and they’re not allowed. Those that actually make the trip anyway are automatically criminalized and imprisoned in refugee camps. That’s concerning. The Book Smugglers: Your friend, Tegan, has been revived after 100 years of cryogenic sleep – and by some is seen as an unwanted/not-real Australian, that is taking precious resources (and taxpayer dollars) away from “real” Australians. Where do you stand on the question of taxpayer dollars, resources, and immigrants? Should Tegan, or any immigrant, be allowed access to Australia’s borders and resources? Abdi: First, I would just like to clarify that Tegan is not an immigrant. She is a natural born Australian citizen. That she died doesn’t mean she stopped being Australian – people talk about famous figures in Australian history as “Australian”, even though they’re dead. Tegan’s citizenry undoubtedly continued posthumously, and into her revival. I do strongly believe that a recognition of basic human rights obliges nations with resources to share with people who have nothing. Whether the revival process is an ethical one, given a vast world population and diminishing resources, is another question. I don’t know the answer, I’m sorry. I’m glad Tegan’s alive. The Book Smugglers: There are a number of militant groups in Australia, violently set against immigrants, in particular, the Australia for Australians (A4A) party. The widespread anger towards immigrants and refugees from third world countries, or “thirdies,” is a frightening reality. Can you talk about the people and reactions you’ve encountered during your time in Australia, good and bad? Abdi: I would rather not. Abdi: It is unpleasant to think about. The Book Smugglers: We respect that. Moving on then – A dirty secret behind Australia’s pristine image is the fact that any refugees who make it to Australia’s shores are thrown into refugee camps – prison camps, really. Do you know about these camps, and what do you think should be done about them? Abdi: The fact of the camps isn’t much of a secret. Australians know the camps are there. But because the media aren’t allowed in to report on what goes on there, there’s no way to tell those stories, to try and get Australians to understand or empathize. The way the camps are run, what might be happening to the refugees – that’s where the secrets lie. I think the refugees should be treated like refugees, not criminals. They are currently treated worse than criminals. Criminals get beds and lawyers and running water. It would be more accurate to say that I think the refugees should be treated like human beings, with the basic rights and dignities of human beings. The Book Smugglers: Which single issue, affected by immigration policies, is the most important to you, to your friends, and to your family? Abdi: Hm. May I rephrase? You can’t really say there’s a “single issue.” For example, The No Migrant Policy is appalling in a number of ways: it’s a powerful nation behaving contemptuously towards the citizens of other, less powerful nations and getting away with it; the criminalization and imprisonment of refugees is a stunning human rights abuse; it enforces the ideology of what’s-mine-is-mine-and-can’t-be-yours; it punishes poverty and promotes xenophobia. But the No Migrant Policy isn’t the refugee problem that most concerns my family – in Djibouti, the major immigration issue is simply providing enough support for the refugees that come to us, primarily from Chad. And again, it’s not just a single issue. We don’t have enough health or mental health professionals to meet their needs, for example, and attracting qualified people to Djibouti can be difficult. When it comes to our refugees, finding enough water is an issue, security is an issue, education is an issue – it’s hard. But at least Djibouti’s making an effort. The Book Smugglers: Thank you, Abdi, for your time and candor. We sincerely appreciate the interview! You can read more about When We Wake on Karen’s website. Karen Healey will also be featured in a Live at the Lounge author video chat on March 23 – she’ll be talking about When We Wake with Malinda Lo! Tune in HERE. Courtesy of the publisher, we have one copy of When We Wake up for grabs! The contest is open to street addresses in the US only and will run until Sunday March 17 at 12:01am (EST). In order to enter, use the form below. Good luck, folks! Make sure to stop by later for our review of When We Wake! Wow. Great premise. Loved reading Abdi’s POV (though I assume that’s Tegan in the book trailer). I headed to Karen Healey’s website to read more about the book. Sounds great. Sorry. When I entered before, I didn’t know the comment question. I read For Darkness Shows the Stars by Diana Peterfreund, which isn’t similar, but has a human rights aspect. One of the first young adult SFF books I read that dealt with the intersection of science and citizenship was Peter Dickinson’s Eva — I don’t know how well it has held up over the years, but that was an intense book back when I was young! I think I would almost say that Bujold’s Vorkosigan books that center around Miles and Mark deal with the question of who is a person and who isn’t, who gets protection under the laws and who is treated like a nonentity, and what makes an individual a citizen. Hmm. Citizenship was one issue in Academy 7. Thanks for the Giveaway! This sounds wonderful, I can’t wait to go out and get my hands on it! And this is more fantasy than Sci-Fi, but I recently read Incarnate by Jodi Meadows and that was all about political rights and having rights and respect within a society in which you are different and perceived to be threatening. One reason I really enjoy reading YA these days is that it seems much more open to addressing human rights and social issues. I’ve recently read Dodger and am currently reading The Kingdom of the Waves, both of which look at historical periods. The Hunger Games and For the Win are outstanding examples of books that look at human rights in a scifi setting. I’ve been rereading Freedom’s Landing by Anne McCaffery and it brings up some very interesting issues about slavery, human rights, and interspecies involvement. It also brings up the topic of conquering vs colonization, lots to think about, especially since it was written over 20 years ago! I will be adding this to my to-read list! I would say The Host by Stephenie Meyer, because it deals with a violation of human rights. I’m going to go with the classic Handmaids Tale. I’d love a copy of this for my very own! I read Orleans by Sherri L. Smith and that really dealt with human rights because a large chunk of the US has been cut off and is barely surviving. The US isn’t helping them – they have no rites. I can see Beth Revis’ Across the Universe series in this category. Hilari Bell’s A Matter of Profit deals with new rulers, assimilation and culture class. It has an interesting perspective on the issues, and doesn’t really come to an easy conclusion. District 9 was a really thought provoking sci-fi movie. Portions of Cloud Atlas, especially the Sonmi-451 sections. I have most recently read Unwind and Unwholly, both by Neal Shusterman. Thanks for the great post and congrats to Karen on the new release! It’s been a while since I read a SFF that dealt with such a heavy topic… someone mentioned Freedom’s Landing by Anne McCaffery which I remember reading when it first came out. Sorry I can’t think of any else! There was this neat book called “Triptych” by J M Frey about a peaceful group of aliens seeking refugee status on Earth. And Susan Bigelow’s superhero series sure addressed the rights of those who scare us. Melina Marchetta’s Finnikin of the Rock (first book in the Lumatere Chronicles), does an excellent job conveying the themes of immigration. Just read Kat Zhang’s What’s Left of Me — decidedly a book about “real citzenship”, racial profiling, and feeding of people’s fear of “different”. What’s Left of Me by Kat Zhang…a book I loved reading last year. I just finished reading The Handmaid’s Tale, which nicely covers some human rights issues. Sadly, I don’t know that I have read many books that cover issues of human rights. I have, however, in the past few months read Unwind by Neal Shusterman, which does a fantastic job about exploring what constitutes life and a handful of human rights issues. It’s a great book with quite a bit of moral ambiguity and a balanced approach to both sides. One of my favorites. Though it came out forever ago, I only read Michael Ondaatje’s Anil’s Ghost recently and it was extremely good. Human rights is a central theme of the novel as Anil, the main character, attempts to find justice for nameless victims of the civil war in her home country of Sri Lanka after studying abroad. I am not the greatest fan of Ondaatje’s writing, but his knowledge of Sri Lanka (where he was born) and its struggles really shines through in the novel. Your question really made me think. This is such an important issue in our world, but I had never really thought about it in relation to YA novels. After thinking about it, I’m going to go with Shabanu by Suzanne Fisher Staples. It’s a powerful story of a young Pakistani girl who is being forced into an unwanted marriage. Staples was a reporter in the area for years and does an amazing job of capturing culture and women’s rights issues. I think The Hunger Games is the biggest one right now, right? It doesn’t deal with people immigrating to the US, but citizens are confined to their own districts for the most part. And I just realized this is supposed to science-fiction or fantasy. That’s a lot harder. The majority of SFF books that deal with human rights tend to be heavily whitewashed or feature white savior problems. Umm, let’s see. I reread Tamora Pierce’s Lady Knight recently; the issue of refugees and combating human rights violations in war is handled fairly well in it. The book When She Woke deals with human rights issues. What’s Left of Me by Kat Zhang is set in a world where babies are born with two personalities ( souls)-one dominant and one weaker- who share one body. Ultimately the question of who has rights to the body and what rights does the weak soul have to survive come into play.